On August 27, 410, the city of Rome was sacked by Visigoths from eastern Europe. This sack of Rome signaled a major turning point in the fall of the Roman Empire. Alaric leads the Visigoths in their sack of Rome in 410. The Visigoths were a Germanic people who lived throughout eastern Europe. On August 27, 410, Visigoths from eastern Europe ended a three-day sack of the city of Rome, now the capital of Italy. This was the first time Rome had been sacked, or defeated and looted, in nearly 800 years. 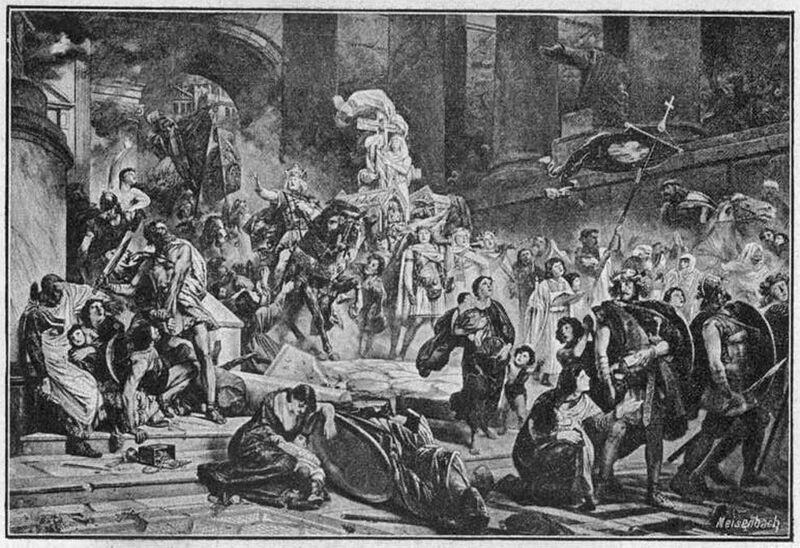 The Visigoth Sack of Rome is considered a major event in the fall of the Roman Empire and the slow move from classical antiquity to the Middle Ages. By the time the Visigoths, led by Alaric, entered the city, Rome had already lost its political position in its former empire. The empire itself had split in two. Real power rested in the Eastern Roman Empire (also called the Byzantine Empire) whose capital was Constantinople, what is today Istanbul, Turkey. The capital of the Western Roman Empire had moved to Ravenna, about 350 kilometers (217 miles) northeast of Rome. The Visigoths themselves were not entirely different from Romans. In fact, Alaric had tried to join forces with the Western Roman Empire for years. Like most Romans, Visigoths were Christians, and gathered and protected Christian treasures in St. Peter’s Basilica, now part of Vatican City in Rome. Still, Rome remained an influential cultural symbol. At its height, the Roman Empire stretched from the entire Mediterranean basin to the beaches of the North Sea in the north, to the shores of the Red and Caspian Seas in the East. “The City which had taken the whole world was itself taken,” wrote St. Jerome of the sacking in 412.
large and important medieval Christian church. having to do with the empires and cultures of ancient Greece and ancient Rome. structure that represents the traditional beliefs, behavior, and identity of a group of people. important; having the ability to lead the opinions or attitudes of others. (500-1500) period in European history between the Roman Empire and the Renaissance. to capture, loot, and largely destroy a city or other targeted area. 44-hectare (110-acre) walled enclave in Rome, Italy, that is an independent state, home of the Pope, and headquarters of the Catholic Church.